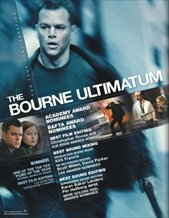 the Bourne Ultimatum is one of the best action/thrillers of all time! An outstanding finale to an outstanding action trilogy. Type your comment here... 15,000 shaky camera angles in this short of a movie makes it some of the worse cinema photography I've ever seen! The first movie was pretty good, the 4th movie was kinda slow but no where near as bad as Supremacy and Ultimatum.